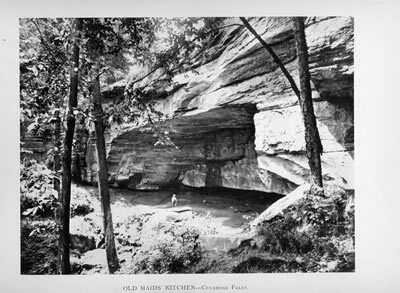 The cave, located in Cuyahoga Falls, inside Gorge Metropolitan Park, was originally known as Old Maid’s Kitchen, until the Daughters of the American Revolution renamed it Mary Campbell Cave. Originally published in Art Work of Akron, Ohio in 1898. During the French and Indian War, the American Revolution, and the other conflicts that arose between the British and then the Americans with American Indians, American Indian peoples living in Ohio commonly raided white settlements, which were illegally located on American Indian lands. American Indian groups defending themselves against violent Anglo-American encroachment sometimes took captives. In some cases, Americna Indian peoples were reported to have tortured and killed these captives. In other cases, Ohio's American Indian peoples would adopt the captured settlers into their families. It was thought at the time that some American Indian groups in Ohio did this primarily because of their dwindling numbers during the late 1700s. The American Indians faced several epidemics in this time period -- including constant war from the Anglo-American settlers, and diseases spread by the Europeans. Most Anglo- American captives adopted into the various tribes eventually were able to gain their freedom. Sometimes this was because a particular American Indian people was conquered by the Europeans, for example. In the resultant treaties, defeated American Indian groups commonly had to relinquish all captives. Some of these adopted natives, such as Mary Jemison among the Senecas, wished to remain with their captors. Many of the people adopted as children had no memories of living as Anglo-Americans Others simply preferred the American Indians' way of life. The American Indians also routinely allowed their adoptive members, after several years, to choose to remain as American Indian, or to return to the cultures of their childhoods.